Many New Yorkers were headed for planes, trains, and automobiles last Wednesday as they decamped for the Thanksgiving holiday, but not new MTA chief Jay Walder and a clutch of Lower Manhattan pols. 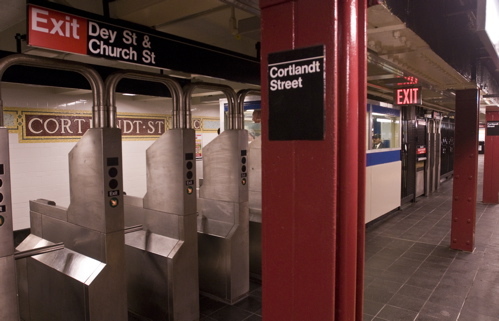 They took the subway to Cortlandt Street, where a re-dedication of the of the the northbound R/W station took place, its restoration—which we first noticed in April—recently completed. “The MTA has played a key role in the revival of Downtown, and we’re excited to provide customers with an improved station just in time for the holidays,” Walder said in a release. 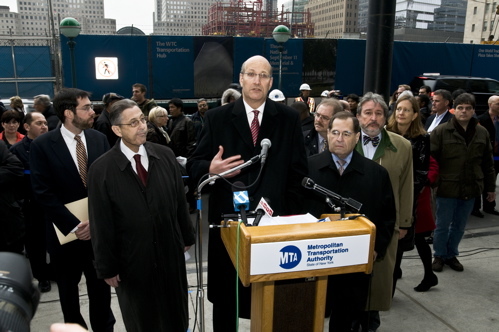 Walder announces the reopening from the podium as he is joined (left to right) by State Senator Daniel Squadron, Assembly Speaker Sheldon Silver, Congressman Jerrold Nadler, and Michael Horodniceanu, president of MTA Capital Construction. 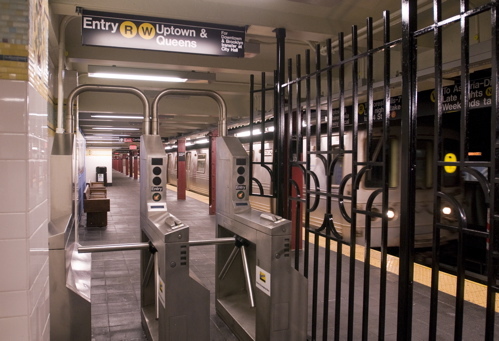 The station first reopened in September 2002 following the 9/11 attacks only to close in 2005 to accommodate work at Ground Zero. It has undergone a few minor changes since then, including wider stairwells—the better to facilitate the hoards of tourists descending on Century 21—and an expanded platform. The walls look much the same as they always have, though, having retained the trademark tile work of the Broadway line, according to MTA spokesman Kevin Ortiz. And while work on the southbound station is only beginning, its reopening was also announced: September 11, 2011, just in time for the tenth anniversary and the opening of the memorial. 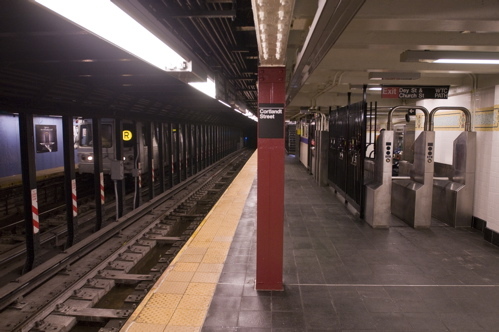 The platform has been improved and slightly expanded, but otherwise it looks the same as it long has, down to the standard Broadway line tiles. Construction is already underway on the southbound platform (behind the blue plywood at left), which will reopen September 11, 2011.